Edwards will endorse Obama, CNN has confirmed. 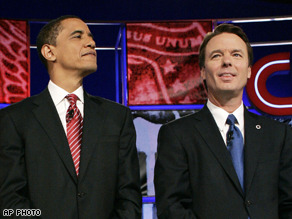 (CNN) - CNN has confirmed that former Democratic presidential candidate John Edwards will endorse Barack Obama shortly at a Michigan campaign event. The endorsement could help Obama reach out to white, blue-collar voters - a demographic group that Obama has failed to capture, most notably in the recent Pennsylvania and West Virginia primaries. Edwards received 7 percent of the vote in Tuesday's West Virginia contest. The former North Carolina senator had campaigned on the message that he was standing up for the little guy, the people who are not traditionally given a voice in Washington, and that he would do more to fight special interests. After dropping out of the race on January 30, Edwards asked both Clinton and Obama to make poverty a central issue of the general election and a future Democratic administration, something both agreed to do. Hillary will need jesus himself to come off a nailed cross to produce a win for her after this! Edwards brings in more superdelegate votes – how can Hillary win – the numbers dont add up!! YES !!! Now if Obama will just offer John Edwards the Vice Presidential slot America will have a bright, effective future for all citizens!!!! If you are still going to support Hillary, then you'll need to move to New York. I agree with other posters, this is a true DREAM TEAM I could get behind. Please Barack don't even consider Hillary. If nothing else it should move Edward's delegates he won over to Barack. DEMS HERE IS THE "SURPRISE" IF HILLARY STOPS RUNNING FOR ANY REASON, SHOW THEM THAT ARE VOICE MATTERS.CHANGE TO REP...I WILL SHOW THEM..
Shame on all these endorsements, let the people speak. Oprah gave Obama credibilty. So many think that from her mouth to God's ear. If you cannot think for yourself and only follow then shame on you. So many waiting to see who Edwards was going to endorse. THINK FOR YOURSELF. I have been wondering why this has taken so long because their policies are so close to the same... This is good timing after the good ole boys and girls from West Virginia showed their true racist colors by giving Clinton her big win. Living near West Va. its well know that if your black you don't want the sun to beat you out of many towns. He loses five out of seven primaries (loses Texas, Ohio, Pennsylvania, Indiana and West Virginia while winning only North Carolina and Mississippi) and everybody oozes about how wonderfully wonderful he is. I just don't get it. The guy who loses California, New York, New Jersey, Pennsylvania, Ohio, Texas, Florida, and Michigan gets the nomination. Good luck with that. John Edwards, by remaining in the election as long as he did, ruined the campaign for Hillary. Now he endorses Obama. Might Edwards think he would be on the short list for VP? But notice Al Gore has not endorsed anyone. Might he be drafted from the floor of the Demcratic Convention? Statistics show that Obama will have a difficult if not impossible time winning a general election over John McCain. The Edwards endorsement should help. Democrats need to stick together, no matter who is on the ballot, if we want to get back into the white house. it would be really unfortunate for us to gain a lot of congressional seats, but lose the presidency. Nothing would change if that happened. Obama has a much better chance of beating McCain in the general election. There's too much Clinton baggage in this country. She's a money-maker for the Republican Party and would propel another Republican into the WH. A wise move from Edwards. That is great, Edwards. I wish you have done it a month ago. I know he was scared of Carville, the mad dog. Good timing Edwards, the teeth of the mad dog is dull now. He has beaten as hard as he can and nothing is left. It's appalling to me that Hillary supporters come in here bashing Obama. True Democrats are not evil or mean spirited people to be acting like this. If you're willing to vote for McCain, you're just as ignorant as all those that voted for Bush in 2004, or maybe you did vote for him in 04. Do this country a favor and stay home on election day. We need not another 4 years of ignorance and stupidity. Why is the issue of Florida and Michigan still on the table? Those states KNEW what they were doing by moving their election dates up. NO one was disenfranchised because the voters KNEW their vote wasn't going to count. Hillary needs to get over it – Obama wasn't even on the ticket in MI, how can she think she EARNED those delegates? The votes will count in November because EVERYONE votes on the same day. No one will be disenfranchised for the presidential vote... Why all this posturing? So, is Edwards going to run a 3rd, a 4th, a 5th, etc... time for Presidency? This is a good guy, but hardly Presidential quality. But perhaps he can be Obama's running mate now, then lose the general election, and in 4 years, clear the path for HC to move into the White House. Not a bad deal; someone should suggest this to HC. But I do wonder what HC's exit strategy will be from the current race? Is she going to announce something no one expected or anticipated, for example deciding to run a independent and forming another political party, or ? What were those West Virginia numbers again??? Is the real voter standing up? People who are working for a better life for their children, a government that supports them and experience to lead them thru the post Bush era aren't voting for Obama. Edwards is on the train that just left the station. Senator Clinton would be a much better choice and I suspect Elizabeth Edwards would agree.